I can't seem to find an option to perform a 'git pull upstream master' using the Mac desktop client for GitHub (currently 1.2.13). Is that supported yet outside of the command line? The Github client does not support this feature as far as I can tell. The way to work around this you can change the primary repo to the upstream repo that you want to use and then change the repo back to your own. Change the "Primary remote repository" to the upstream repo you want to use. Change the "Primary remote repository" back to the original forked repo you were using. According to the mac client's homepage, the "sync button" will perform this operation for the configured remote repository. 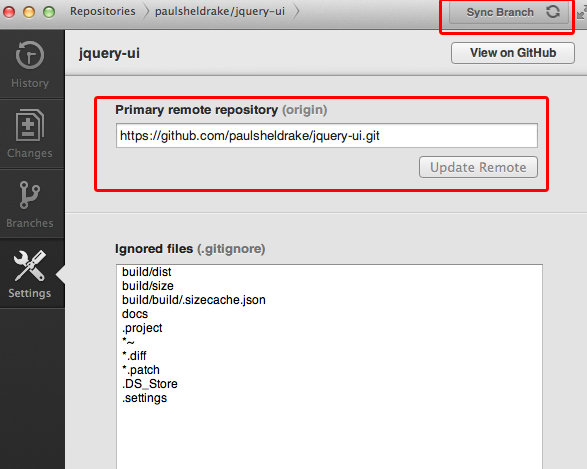 The sync button pushes your changes to GitHub and pulls down other’s changes in one operation. It notifies you when you have changes you haven’t pushed or there are new changes on GitHub you haven’t pulled down. I can't find a way to support multiple remotes with the current version of the client (Version 1.2.13 (b919fb2)), but in a pinch I suppose you could change the "Primary remote repository" under "Settings" on the left sidebar. It is possible to do it with recent versions of the GitHub client (at least the Mac version), but it's not particularly easy. Not the answer you're looking for? Browse other questions tagged git github github-for-mac or ask your own question.